1. While trying to submit payment you receive and error asking for correct discount code. Some browsers will automatically populate fields, like name, address, etc. we are currently having an issue where the coupon code gets automatically populated when submitting payment. If you get the above error, backspace/delete everything in the coupon code field and hit FINISH again. The system shouldn't make you enter your credit card info a second time. 2. The system says I am already registered and you are not. If you are registering a guest, please follow the directions in number 3. If you are registering yourself, it may be that you are using a family email or one you share with your spouse. Our registration system can only recognize one registrant per email. You can either register as a guest on the registration of the person in your family that has already registered, or use a different email to register. 3. You are unable to register another guest. Enter your email and confirmation number from your confirmation email. Then choose OK. Next click on the MODIFY button. Under your name on the next screen will be ADD A GUEST. Use this button to add additional guests. 4. How do I print out my name badge? 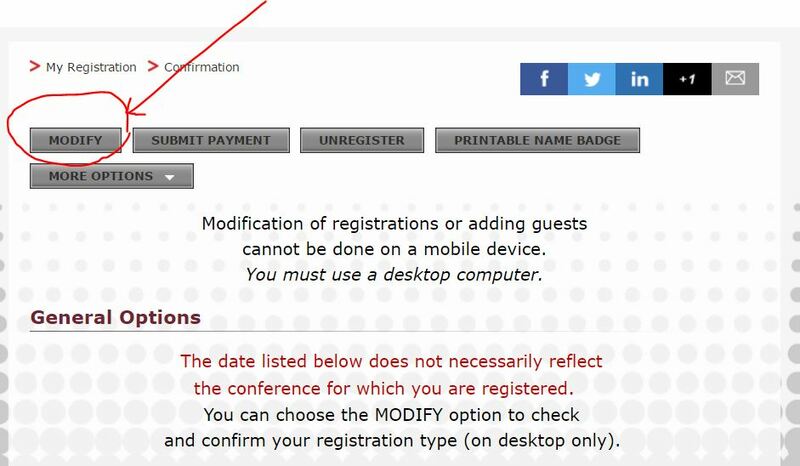 At the end of a successful registration you will be directed to a confirmation page. 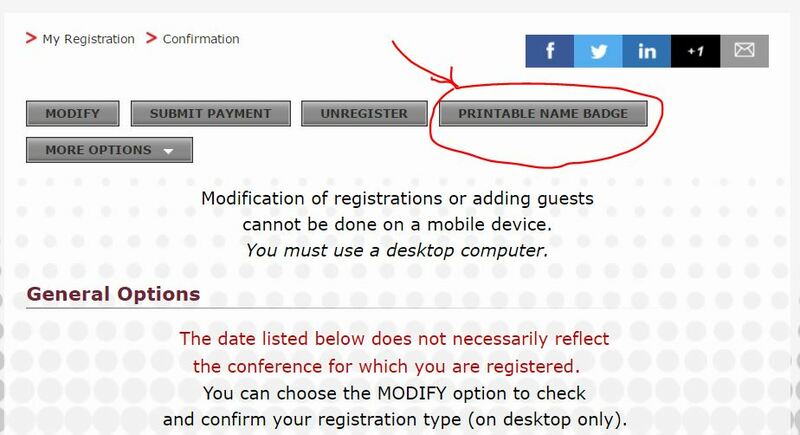 Choose the PRINTABLE NAME BADGE button to print out your name badge (see below). 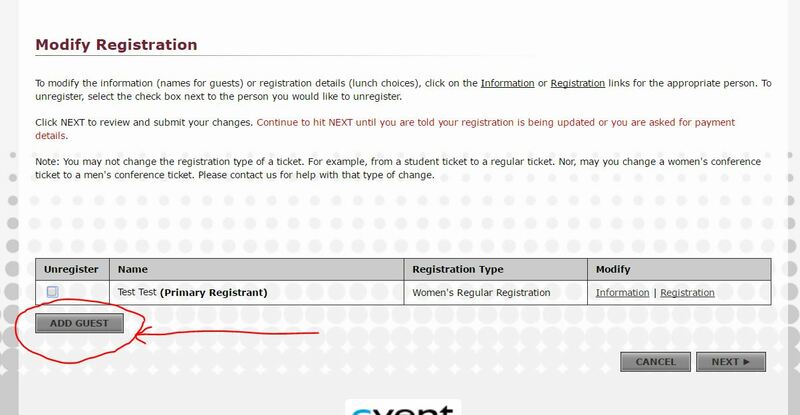 Or by going to the home registration page and choosing "Already Registered"
When is the conference? The 2019 men's conference is on February 23, 2018 from 8 am to 3 pm and is at Kasich (formerly Cardinal) Hall at the Ohio Expo Center. How do I get to Kasich Hall? Click here for directions. Can I attend this event if I am not Catholic? Yes, we welcome people of all faiths. Where is my ticket? If you successfully registered online, your ticket will have been available to print. Please bring it with you to the conference. It is your admission ticket and also your nametag. If you registered by mail and included an email address, it will be emailed to you. If you do not provide an email, you will be able to collect your ticket at the registration desk the day of the conference. HELP!! I can't print my ticket! Now what? We first recommend that you forward your email confirmation to a friend or relative to see if they can print for you. If you are unable to print, don't worry, we've got you covered. We will have a print out of all the tickets the day of the conference and you can receive by stopping at the registration desk the day of the conference. Is this event diocesan wide? Yes, the conferences are for all men in the Columbus Diocese and even to those who live outside of our diocese. What will be served for lunch? What if I have dietary restrictions? A catered box lunch will be provided. If you have dietary restrictions, vegetarian and gluten free lunches will be offered. Low gluten hosts are provided by the Benedictine Sisters of Perpetual Adoration. For more information on the gluten content of the low gluten hosts that will be provided at mass, click here. Can I buy a ticket at the door? For planning purposes we strongly encourage you to pre-register, but you can walk-in the day if the conference for $45. How can I buy a ticket without using the internet? We prefer that you register online. If you do not have a credit card, you may register by mail. Please pay attention to your parish bulletin or the Catholic Times. You can also print a form at the Catholic Men's Ministry site. What kind of vendors will be at the conference? Due to the focus of the conference, as well as physical limitations, we are limiting the vendors to those with Catholic products or services only. Some vendors may not accept credit cards, so please plan accordingly. Will there be a Mass? Yes, the conference concludes with Mass celebrated by Bishop Campbell. The vendors WILL NOT be open during Mass. May my son attend? Yes, he may. The conference may be a wonderful bonding time. The speakers' topics are geared toward adults, so while each child is different, kids younger than high school age might not be mature enough to fully comprehend the topics. There is a discounted rate for students. I see the Sacrament of Reconciliation will be offered, am I expected to go? No, you do not have to go. Reconciliation should be beautiful and not an intimidating experience, a sacrament designed by God to let Him carry your heavy burdens. If you do not feel called to attend, feel free to shop our many vendors, enjoy lunch, or visit with the speakers and other attendees. No one will judge you if you do not go. I have fallen away from the Church and am hesitant to attend, am I welcome? You are fully and completely welcome. We want you to come, to take that one step back toward God and His church. Sometimes all it takes is just one step to bring about a major change. Can I receive Catechist Certification Enrichment hours for attending the conference? Yes! Use the usual Process, 11.9A form and you will receive 3 hours of enrichment upon receipt by the Office of Religious Education and Catechesis.